This item allows you to create a magnificent fireworks display anywhere and anytime you'd like. It matches the effect of the Dalaran Firework and has a cooldown of only 30 seconds. The Fireworks Trinket was available through the UDE Points Store at a cost of 3,000 points. When purchasing the Fireworks Trinket loot, you'll be given a 25 digit code which will be used to obtain the trinket from Landro Longshot in Booty Bay. 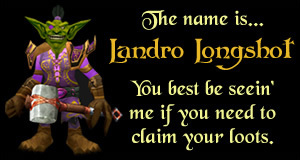 Landro will ask for your code, then once he's verified it, will present you with a Perpetual Purple Firework! As of 3.2.2, this item is no longer a trinket and therefore does not need to be equipped. It just needs to be in the player's bag inventory in order to be used.